Perhaps you have purchased a used crib mattress from a furniture store or yard sale, or you may have even received a mattress from a relative who no longer needs it. In any instance, before you use the crib mattress you want to clean it to remove any dirt or bacteria, making it safe for your baby. When cleaning, you must also consider the actual cleaning products that you will use, as chemically-based products can actually introduce harmful elements to the mattress. Cleaning a crib mattress is easy. Vacuum the crib mattress to remove light dust and buildup. Remember to vacuum along the seams where dirt often sticks. Mix 1 gallon warm water, 1 cup vinegar and 1/4 cup laundry detergent in a cleaning bucket. 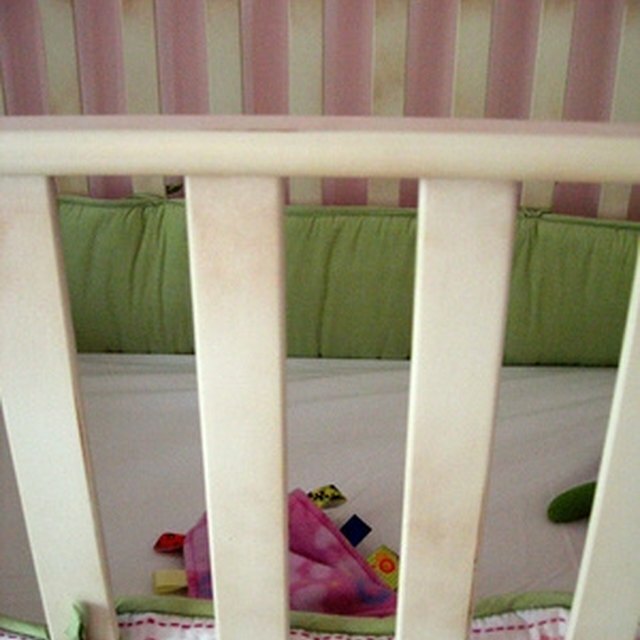 Dip a soft brush in the solution, and scrub gently over the crib mattress. Continue until you have cleaned an entire side of the mattress. Rinse a cleaning rag with warm water only, wring out and wipe over the side of the mattress that you have just cleaned. Repeat this procedure on the opposite side of the mattress as well as along the side seams. Sit the crib mattress in direct sunlight, when possible, and allow to fully air dry before using the mattress.